This Emergency Pipe Repair Clamp by Rothenberger is a quick, easy, and professional way to temporarily repair a burst, perforated, or leaky pipe or fitting. This repair clamp is a great item to have in most every building. In cases of emergency like a bursted pipe in a building where the water supply cannot be shut off, this tool can save a lot of time, energy, and money. This emergency pipe repair clamp is for ½” pipe. Simply open the device, center it around the problem area, firmly close both housing members, engage the latch mechanism, and close the device around the problem area with a squeeze of the hand. View the Emergency Pipe Repair Clamp for ¾” Pipe. 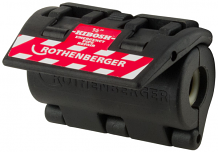 Learn more about the Emergency Pipe Repair Clamp (1/2" pipe) by Rothenberger USA LLC or save and print or email a PDF about the product in our blog post.